Best Beginner Surfboards: The Top 9 In 2019 To Start Surfing! Even the most experienced surfers can feel overwhelmed by the countless surfboards on the market. Each board is unique, and there are tons of terms to describe the small differences between them. Since these “small differences” can completely change the way each board surfs, looking for advice on your first purchase is a great choice. We’ve compiled an inclusive guide to buying your first surfboard and understanding how it works, so look no further for a simple breakdown of how to buy your first board. Weight capacity up to 230 lbs. Weight capacity up to 200 lbs. 4 How To Choose a Surfboard For Beginners? Rather than having to choose from the hundreds of boards out there, we’ve narrowed it down to the top nine best beginner surfboards to make your choice that much easier. We sifted through boards of all shapes and sizes to find the ones that are most suitable for learning. While all of these boards will make learning to surf easier, our reviews will help you decide which board is the most suitable for you. The SBBC 8’ Verve Soft Top was made for speed. 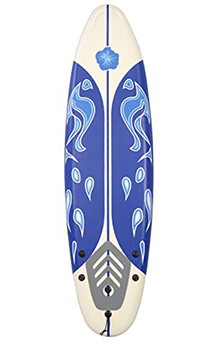 It’s wide and thick shape provides plenty of paddling power, while its shape is fine-tuned for speed and precision. The tri-fun set up makes sure that when you’re coming into your turns with all of that speed, you’ll glide smoothly down the face of the wave. 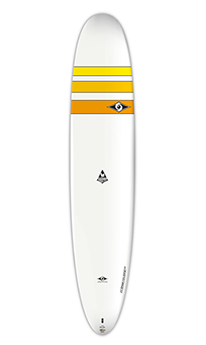 The Wavestorm 8’ Classic is most recognized soft-top surfboard in the game for a reason. It's universal, easy-to-use qualities make it suitable for any surfer. With a slightly narrower width than the SBBC Verve, it will maneuver quickly and smoothly. What you’re giving up in width may reduce your paddling power, but this board is still perfect to catch beginner-sized waves. The SBBC 7’ Soft Top is more performance based than our other top two boards, making it easy to surf bigger waves and carve longer turns. Suitable for a slightly smaller surfer, this board doesn’t have the high volume found in the longer SBCC 8’ and Wavestorm 8’. This lower volume will make the board easier to handle and a breeze to carry around with you. Highly recommended for younger, smaller beginners and surfers advancing into larger waves. 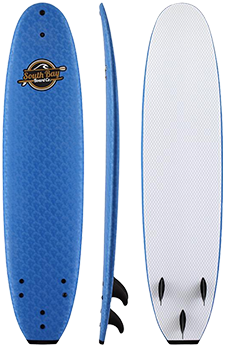 The Surftech 8’ Soft Top has been called the most durable soft top surfboard you can buy. Even with a triple stringer to keep the board from breaking, it’s lightweight and easy to paddle. This classic soft top is suitable for surfers of all shapes and sizes. The BIC Sport Ace-TEC surfboard is modeled after a classic longboard. 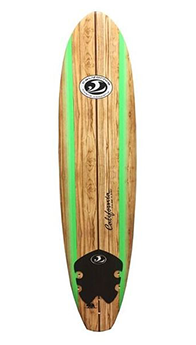 At nine feet long and four inches thick, this board has enough volume to give any surfer optimum paddling power. Unlike the previous soft top options, epoxy-based boards like this one take durability to a whole new level. This board can be expected to stick with a surfer for many years to come. The California Board Company 7’ surfboard is another soft top made for either light-weight or more advanced beginners. Its shorter length will handle bigger surf, while its triple stringer will ensure durability in those harsher conditions. It also includes a traction pad to avoid slipping, and its wooden graphics make it look like a classic wood surfboard. The BIC Sport EVO soft top comes in four different sizes to suit any surfer. While the 5’6 is perfect for a little grom, the 9’0 can handle any sized surfer. Choosing the right size depends on your weight and skill level, but going a little bit bigger is never a bad choice. Whether you’re going for the 5’6, 7’0, 8’0, or 9’0, this board won’t disappoint. 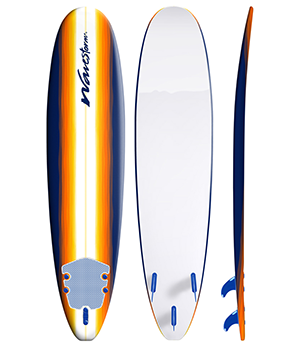 The Thurso Surf 5’10” Fish is unique among our top picks because of its twin fin, fish tail setup. While the fishtail makes turning quicker and smoother, the fins will keep the boards grip on the wave – even on your biggest turns. 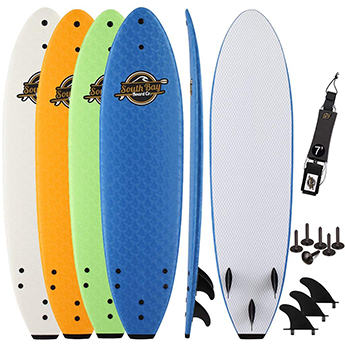 For surfers who want to spend more time in bigger, steeper waves, this board is a great choice. It’s designed for stability and traction, while still giving the surfers enough speed to crank out a few big turns. The Giantex 6’0 Foamie is our top choice for the best surfboard for kids. While it’s durable and lightweight, it also has a colorful design and removable fins. The removable fin design will keep your kids safe in bigger waves, while the colorful deck will get them stoked. In three different color designs, this board is a perfect fit for your young beginners. After choosing the right board for you, it’s a good idea to read up on some simple steps every beginner needs to know. Although there is no definitive rulebook on “How to Surf”, knowing the basics will not only make learning easier, but much more fun. Step 1: Before you head to the beach, look up a guide on surf etiquette. It is essential to follow these unspoken rules of the lineup in order to stay safe and be respectful. Finding a partner, whether it’s a paid instructor, a friend, or some stranger on the beach. Having someone in the water to guide you is vital for your first few sessions. It’s easy to underestimate the size and power of the waves, so use the buddy system! Practicing the pop up, whether it’s on the beach or in the shore break, will help you ride real waves quicker and easier. Without the pop up, beginners will end up riding countless waves on their stomach. While this tends to be a part of learning, it’s best to get this step down before paddling into a lineup. Once your surfing buddy has correctly directed you towards the lineup, you’ll want to start thinking about paddling into a wave. Try not to get too eager here, because not every wave is going to be the right one. You’ll want a wave that is peaking (at the highest point before breaking) right behind you. Then, you can paddle hard until you feel the wave picking up your board. This may take a few tries, and it’s wise to paddle hard until you’re sure you’re in the wave – those last few can make all the difference. The last crucial step to riding any wave is making your bottom turn. You can notice the difference between the surfers who stay in the wave and the ones who ride straight into the whitewash. While going straight is bound to happen to any beginner, try to turn the same way as the wave is moving as soon as you start to gain speed. This turn will give your board the speed that it needs to ride the rest of the wave, without getting caught up in the part of the wave that’s already broken. The bottom turn takes practice, but a few rules of thumb are to bend your knees, put your weight on your back foot, and then straighten your legs and evenly distribute your weight. How To Choose a Surfboard For Beginners? While doing your research on which board to choose, you’re likely to come across lots of terms you may not recognize. While knowing about each of these aspects of a surfboard is important for choosing the right one, the way that they all relate to each other determines how the board will work. Learning about each individual characteristic is the first step in understanding the function of surfboard shapes. As your surfing progresses, it’s essential to begin thinking about riding the right board for the conditions your surfing. Knowing about the function of the basic types of boards will help you understand which boards are fit for which conditions. A shortboard, also known as a thruster for its tri-fin setup, is what you’ll commonly see the pros riding. Shortboards are not ideal for beginners because they’re meant for big waves, turns, and airs. 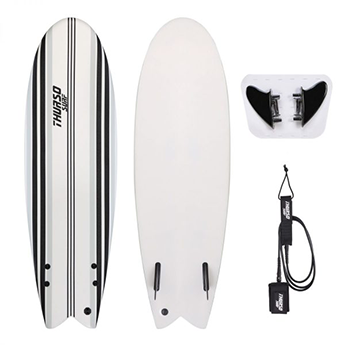 Shortboards are maneuverable and easy to handle in the water. They’re typically short and narrow with low volume, which makes them less buoyant and harder to paddle. A fishtail is a shortboard that tends to be wider and shorter with an inverted triangle shaped tail. It is similar to the shortboard because it’s also meant for bigger surf and drawn out turns, but it works better in mushier surf than your typical shortboard. A mid0length is a board with more volume than a shortboard, but less than a longboard. Like many of the soft tops that we suggested, a funboard is usually in the 7’0”-8’0” range. Boards this size are ideal for a transition down to a shortboard because they still provide buoyancy and paddling power, but make turning and maneuvering much easier. Longboards are the most traditional surfboard shape, usually over 8’0” long. Their high volume allows for fun sessions in small surf. The graceful glide that a longboard allows is much different than the quicker, more aggressive style of shortboarding. Longboards are a great place to start once you feel comfortable on a soft top because of the similar volume but additional function that they provide. A gun is meant for very big surf – usually overhead and above. While this won’t be a purchase that beginners will be making for a while, it’s smart to be able to identify a gun because they can sometimes be mistaken for shortboards. While they’re typically a bit longer than a traditional shortboard, they are similarly narrow and have a sharp nose. On the other hand, they’re much thicker, which allows buoyancy in big waves and super quick drops. They will also have lots of nose rocker and an extremely narrow nose. When it comes to surfboards, size does matter. Surfboards have three very important dimensions – length, width, and thickness. Together, these create the volume of the surfboard. The volume will determine how much floatation the board has, which will make a huge difference in your ability to paddle into waves and balance on your board. When you’re learning, it’s always a good idea to stick to bigger boards because you’ll be able to paddle into waves easier and keep your balance once you’re up. The length of your board is the most closely correlated with your height. Taller surfers will always want a longer board than shorter surfers because their stance will be wider. Having the space to adjust your stance is essential. Length can be broken down into two basic (and obvious) categories: long and short. Long surfboards will have more stability and speed, while shorter surfboards will have more maneuverability. The width of your board is the most closely correlated with its ability to float. The more floatation a board has, the easier it will be to paddle, balance, and get into waves. Narrower boards will be more responsive to small movements, which is why they’re commonly used in bigger waves. The thickness of your board also affects floatation, and especially paddling power. The function of a thinner board is to be able to take huge turns (aka “digging the rails”), which beginners won’t be doing quite yet. Instead, getting a thicker board will help you catch more waves and surf in smaller conditions. While buying your first board, size does matter…and bigger is definitely better. The rocker of a surfboard is the curve that goes from the nose to the tail. When looking at a board from the side, you’ll be able to see the rocker. The idea behind rocker (or lack thereof) is that when you have more rocker (more curve), the nose is less likely to dig into the water and nose-dive the board. When there is less rocker, the board is more likely to nose-dive, but it’s also harder to get into the wave. Having more rocker, or more curve in the shape of your board, allows for more maneuverability. When dropping into a big, steep wave, rocker is necessary for the board not to nose-dive. Since beginners won’t be riding waves of this caliber, rocker will probably only make learning more difficult. Rocker makes it difficult to get into the wave because there is less surface of the board on top of the water, so the wave won’t “pick you up” as easily. Having less rocker allows you to glide on the surface much easier, which is why longboards tend to make surfing look so effortless. The combination of size and rocker allows a surfer to “set a line”, or direct the board, and let the wave do the rest of the work. Finding a balance between no rocker and just enough will ensure that you’re able to get into plenty of fun rides, while still preventing the board form nose-diving into the wave. The rails of a surfboard can be either hard or soft. Whether your board has hard or soft rails will determine the buoyancy, the drive, and the stability. Rails have foils, which are where the apex of the rail is in relation to the curve. The foil can be closer to the bottom of the board to give it a harder edge, or in the center to give it a softer, more rounded edge. Hard rails have more defined edges, so the curve of the rail is more abrupt than a board with soft rails. This functions by holding the rail of the board into the wave while turning, so hard rails are common in performance boards. An 80/20 would be a very defined hard rail, while a 60/40 is a lighter hard rail. Soft rails have a consistent, balanced curve in the edge, so they’re typically found on bigger boards. Softer rails provide more volume and less sensitivity to small movements. Soft rails are ideal for a beginner because they’re more forgiving and will generate more speed while the board is moving in a straight line. The top of your board is called the nose. The nose is the key element when dropping into waves, which is why guns and shortboards have narrow noses – to prevent nose-diving. While wider noses make nose-diving more likely, they also make it possible to paddle into small waves. While there are many nose designs, the most common are the round nose, the pointed nose, and the rounded-point nose. The round nose is commonly found on longboards, so beginners will be acquainted with this design. It provides a larger surface area, which provides stability and buoyancy. Round noses are also critical for nose-riding, which is a common longboarding trick where the surfer walks to the nose of the board. A round nose allows them to balance there and still maintain speed and control over the board. The pointed nose is the opposite of a round nose. It’s typical in performance boards like guns and shortboards because it allows for critical, steep take-offs. It doesn’t work well in small waves because there is such small surface area to propel the board into the wave. On the other hand, it does make duck diving easier when a big set comes. The rounded-point nose is a compromise between the previous two extreme shapes. It has enough width to paddle into average-sized waves, but it’s narrow enough to avoid nose-diving. Rounded-point noses are common on mid-lengths and funboards, so it’s likely that you’ll become familiar with this shape when you begin transitioning to smaller boards. Before getting into the specifications of fin types, it’s important to know how many fins your board will actually need. Most boards will make this very obvious by having one or more fin boxes that only fit one type of fin. For example, a shortboard will usually have three fin boxes meant for a certain type of fin. That is why shortboards are commonly referred to as “thrusters” – meaning three fins. On the other hand, longboards usually only have one fin box, referred to as “single-fins”. To make things more complicated, there are also twin-fins (usually found on the fishtail boards discussed earlier), quads (also a shortboard variation), and bonzers (shortboards with five fins!). Some boards will have the fins glassed into the board, while others will have fin boxes that fit different sized fins. In order to understand what size fin your board needs, there are some terms that need to be understood. Choosing the right fin(s) for your board can seem overwhelming because there are so many options to choose from, but don’t worry – once you understand the terminology, choosing the right fin(s) is pretty simple. The base of a fin measures the widest part of the fin, which is the part that attaches to the board. A larger base creates more speed because more water will be moving around the part of the board that meets the fin, helping push your board down the line. The drive that a larger base provides is beneficial for beginners who don’t want to have to turn to generate speed. Later, as you transition to shorter boards, fins with a smaller base will help loosen up your board and increase maneuverability. Fin height, also generally called fin depth or fin size, is how deep into the water the fin will go. A larger fin, usually in the 8”-10” range, will be used on a longboard. Three smaller fins, usually 5”-6”, will be used on shortboards. A larger fin will provide more hold on the wave, giving you more control. Smaller fins sometimes come completely out of the water (big turns, airs), which makes the board much more difficult to control. The flex of a fin refers to how much movement the fin has from side to side. A fin with more flex has greater drive and will stay in the water during turns, while a stiffer fin will easily release from the wave. There is no need for the fins to release from the wave unless you’re doing huge turns or aerial maneuvers, so a flex fin is ideal for bigger boards. To avoid any road-blocks during your first few surf sessions, carefully read this comprehensive list of tips and tricks. Being informed about proper surf etiquette is essential to maintaining a fun, respectful lineup. Make sure to memorize all of these unspoken rules and practice them in each of your future surf sessions. They say that you’ve got to start somewhere… if you’re looking for the place to first paddle out, this article will send you in the right direction. Surfing provides countless health benefits for both your body and your mind. To understand how to maximize these benefits, it’s a great idea to understand the ways in which surfing can benefit you. In order to get all of the health benefits mentioned above, make sure to do the proper training before and after surfing. Even a short stretch will help prevent injury and allow you to surf your very best. Do you need to know how to swim to surf? Yes! If you can’t comfortably swim to the lineup and back, then you shouldn’t paddle out. Although having a big floatation device with you may seem like a safety net, it’s considerably harder to get through a big wave or a set with a board. It’s also not uncommon for a leash to break, which results in you losing your board and having to swim in. If you’re not comfortable being in the water without a board, it’s definitely not a good idea to paddle out. It could take days, months, or years to learn how to surf. There are countless factors that can affect how long it’ll take to learn, but the best advice for beginners is to stick with it and go regularly. 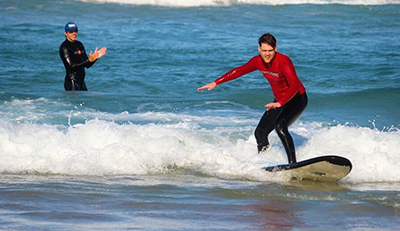 Surfing in different conditions, on different boards, and in different waves can all help you progress quicker. It doesn’t matter how quickly you become an expert, as long as you’re having fun! What are the best places to learn how to surf? Great question! It’s a good idea to do your research and find somewhere near you that’s ideal for beginners. This will typically be a point break with multiple peaks, so that you can sit inside of the largest peak of the wave. This way, you can watch the more experienced surfers and get the waves that are breaking on the inside. It’s also smart to do research before choosing a spot because you want to ensure that there aren’t any hazards – rocks, rip currents, and sea cliffs are all easily avoidable if you find the right place. Now that you’ve done your research, it’s time to choose a board and get out there! Learning to surf can spur a lifelong passion for the sport and for the ocean, but having the right board can make surfing much more enjoyable. It’s no fun paddling for wave after wave and not catching anything, which is why we’ve recommended the boards deemed best suited for learning. The SBBC 8’ Verve is our #1 choice because it is a well-rounded board that will work well for any beginner. With the ability to keep surfers from 70 lbs. up to 230 lbs. afloat, the SBBC Verve is guaranteed to work for surfers of all shapes and sizes. South Bay Board Co. has designed a “catch-every-single-wave foam surfboard” so that beginners can learn quickly and easily. Your first board is a one-way ticket to a lifelong passion, so what are you waiting for?